Lightning is a powerful natural electrostatic discharge produced during a thunderstorm. Lightning's abrupt electric discharge is accompanied by the emission of visible light and other forms of electromagnetic radiation. The electric current passing through the discharge channels rapidly heats and expands the air into plasma, producing acoustic shock waves (thunder) in the atmosphere. The first process in the generation of lightning is the forcible separation of positive and negative charge carriers within a cloud or air. The mechanism by which this happens is still the subject of research, but one widely accepted theory is the polarization mechanism. This mechanism has two components: the first is that falling droplets of ice and rain become electrically polarized as they fall through the atmosphere's natural electric field, and the second is that colliding ice particles become charged by electrostatic induction. Once charged, by whatever mechanism, work is performed as the opposite charges are driven apart and energy is stored in the electric fields between them. The positively charged crystals tend to rise to the top, causing the cloud top to build up a positive charge, and the negatively charged crystals and hailstones drop to the middle and bottom layers of the cloud, building up a negative charge. Cloud-to-cloud lightning can appear at this point. Cloud-to-ground lightning is less common. Cumulonimbus clouds that do not produce enough ice crystals usually fail to produce enough charge separation to cause lightning. When sufficient negatives and positives gather in this way, and when the electric field becomes sufficiently strong, an electrical discharge occurs within the clouds or between the clouds and the ground, producing the bolt. 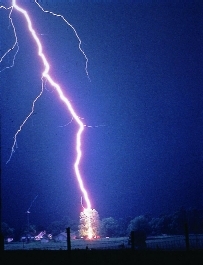 It has been suggested by experimental evidence that these discharges are triggered by cosmic ray strikes which ionize atoms, releasing electrons that are accelerated by the electric fields, ionizing other air molecules and making the air conductive by a runaway breakdown, then starting a lightning strike. During the strike, successive portions of air become conductive as the electrons and positive ions of air molecules are pulled away from each other and forced to flow in opposite directions (stepped channels called step leaders). The conductive filament grows in length. At the same time, electrical energy stored in the electric field flows radially inward into the conductive filament. When a charged step leader is near the ground, opposite charges appear on the ground and enhance the electric field. The electric field is higher on trees and tall buildings. If the electric field is strong enough, a discharge can initiate from the ground. This discharge starts as positive streamer and, if it develops as a positive leader, can eventually connect to the descending discharge from the cloud. A bolt of lightning usually begins when an invisible negatively charged stepped leader stroke is sent out from the cloud. 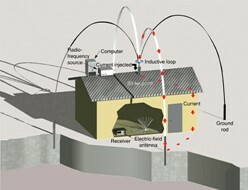 As it does so, a positively charged streamer is usually sent out from the positively charged ground or cloud. When the two leaders meet, the electric current greatly increases. The region of high current propagates back up the positive stepped leader into the cloud. This "return stroke" is the most luminous part of the strike, and is the part that is really visible. Most lightning strikes usually last about a quarter of a second. Sometimes several strokes will travel up and down the same leader strike, causing a flickering effect. This discharge rapidly superheats the leader channel, causing the air to expand rapidly and produce a shock wave heard as thunder. It is possible for streamers to be sent out from several different objects simultaneously, with only one connecting with the leader and forming the discharge path. Photographs have been taken on which non-connected streamers are visible such as that shown on the right. This type of lightning is known as negative lightning because of the discharge of negative charge from the cloud, and accounts for over 95% of all lightning. Positive lightning makes up less than 5 % of all lightning. It occurs when the stepped leader forms at the positively charged cloud tops, with the consequence that a negatively charged streamer issues from the ground. The overall effect is a discharge of positive charges to the ground. Research carried out after the discovery of positive lightning in the 1970s showed that positive lightning bolts are typically six to ten times more powerful than negative bolts, last around ten times longer, and can strike several kilometers or miles distant from the clouds. During a positive lightning strike, huge quantities of ELF and VLF radio waves are generated. As a result of their power, positive lightning strikes are considerably more dangerous. At the present time, aircraft are not designed to withstand such strikes, since their existence was unknown at the time standards were set, and the dangers unappreciated until the destruction of a glider in 1999. An average bolt of positive lightning carries a current of 300 kiloamperes (about ten times as much current as a bolt of negative lightning), transfers a charge of up to 300 coulombs, has a potential difference up to 1 gigavolt (a thousand million volts), dissipates enough energy to light a 100 watt light bulb for up to 95 years, and lasts for tens or hundreds of milliseconds. Heinz Kasemir first hypothesized that a lightning leader system actually develops in a bipolar fashion, with both a positive and a negative branching leader system connected at the system origin and containing a net zero charge. This process provides a means for the positive leader to conduct away the net negative charge collected during development, allowing the leader system to act as an extending polarized conductor. Such a polarized conductor would be able to maintain intense electric fields at its ends, supporting continued leader development in weak-background electric fields. During the eighties, flight tests showed that aircraft can trigger a bipolar stepped leader when crossing charged cloud areas. Many scientists think that positive and negative lightning in a cloud are actually bipolar lightning. To spontaneously ionize air and conduct electricity across it, an electric field of field strength of approximately 2500 kilovolts per meter is required. However, measurements inside storm clouds to date have failed to locate fields this strong, with typical fields being between 100 and 400 kilovolts per meter. While there remains a possibility that researchers are failing to encounter the small high-strength regions of the large clouds, the odds of this are diminishing as further measurements continue to fall short. A theory by Alex Gurevich of the Lebedev Physical Institute in 1992 proposes that cosmic rays may provide the beginnings of what he called a runaway breakdown. Cosmic rays strike an air molecule and release extremely energetic electrons having enhanced mean free paths of tens of centimeters. These strike other air molecules, releasing more electrons which are accelerated by the storm's electric field, forming a chain reaction of long-trajectory electrons and creating a conductive plasma many tens of meters in length. This was initially considered a fringe theory, but is now becoming mainstream because of the lack of other theories. It has been recently revealed that most lightning emits an intense burst of X-rays and/or gamma-rays which seem to be produced during the stepped-leader and dart-leader phases just before the stroke becomes visible. The X-ray bursts typically have a total duration of less than 100 microseconds and have energies extending up to nearly a few hundred thousand electron volts (How big is an electron volt). The presence of these high-energy events match and support the "runaway breakdown" theory, and were discovered through the examination of rocket-triggered lightning, and from satellite monitoring of natural lightning. NASA's RHESSI satellite typically reports 50 gamma-ray events per day, and many of these are strong enough to fit the theory. Additionally, low-frequency radio emissions detected at ground level can detect lightning bolts from upwards of 4000 km away; combining these with gamma-ray burst events detected from above show overlapping positions and timing. There are problems with the "runaway breakdown" theory, however. While there seems to be a strong correlation between gamma-ray events and lightning, there are insufficient events detected to account for the amount of lightning occurring across the planet. Another issue is the amount of energy the theory states is required to initiate the breakdown. Cosmic rays of sufficient energy strike the atmosphere on average only once per 50 seconds per square kilometer. Measured X-ray burst intensity also falls short, with results indicating particle energy 1/20th of the theory's value. During early investigations into electricity via Leyden jars and other instruments, a number of people (Dr. Wall, Gray, and Abbé Nollet) proposed that small-scale sparks shared some similarity with lightning. Benjamin Franklin, who also invented the lightning rod, endeavored to test this theory using a spire which was being erected in Philadelphia. Whilst he was waiting for the spire completion, some others (Dalibard and De Lors) conducted at Marly in France what became to be known as the Philadelphia experiments that Franklin had suggested in his book. While waiting for completion of the spire, he got the idea of using a flying object, such as a kite, instead. During the next thunderstorm, which was in June 1752, he raised a kite, accompanied by his son as an assistant. On his end of the string he attached a key and tied it to a post with a silk thread. As time passed, Franklin noticed the loose fibers on the string stretching out; he then brought his hand close to the key and a spark jumped the gap. The rain which had fallen during the storm had soaked the line and made it conductive. However, in his autobiography (written 1771-1788, first published 1790), Franklin clearly states that he performed this experiment after those in France, which occurred weeks before his own experiment, without his prior knowledge as of 1752. As news of the experiment and its particulars spread, the experiment was met with attempts at replication. However, experiments involving lightning are always risky and frequently fatal. The most well-known death during the spate of Franklin imitators was that of Professor Georg Richmann, of Saint Petersburg, Russia. He had created a set-up similar to Franklin's, and was attending a meeting of the Academy of Sciences when he heard thunder. He ran home with his engraver to capture the event for posterity. While the experiment was underway, a large ball lightning showed up, collided with Richmann's head, and killed him, leaving a red spot. His shoes were blown open, parts of his clothes singed, the engraver knocked out, the doorframe of the room split, and the door itself torn off its hinges. An initial discharge, (or path of ionized air), called a "stepped leader", starts from the thundercloud and proceeds generally downward in a number of quick jumps, typical length 50 meters, but taking a relatively long time (200 milliseconds) to reach the ground. This initial phase involves a small electric current and is almost invisible compared to the later effects. When the downward leader is quite close, a small discharge comes up from a grounded (usually tall) object because of the intensified electric field. Once the ground discharge meets the stepped leader, the circuit is closed, and the main stroke follows with much higher current. The main stroke travels at about 0.1 c (100 million feet per second) and has high current for 100 microseconds or so. It may persist for longer periods with lower current. In addition, lightning often contains a number of restrikes, separated by a much larger amount of time, 30 milliseconds being a typical value. This rapid restrike effect was probably known in antiquity, and the "strobe light" effect is often quite noticeable. Positive lightning does not generally fit the above pattern. Intracloud lightning is the most common type of lightning which occurs completely inside one cumulonimbus cloud, and is commonly called an anvil crawler. Discharges of electricity in anvil crawlers travel up the sides of the cumulonimbus cloud branching out at the anvil top. Cloud-to-ground lightning is a great lightning discharge between a cumulonimbus cloud and the ground initiated by the downward-moving leader stroke. This is the second most common type of lightning. One special type of cloud-to-ground lightning is anvil-to-ground lightning, a form of positive lightning, since it emanates from the anvil top of a cumulonimbus cloud where the ice crystals are positively charged. In anvil-to-ground lightning, the leader stroke issues forth in a nearly horizontal direction till it veers toward the ground. These usually occur miles ahead of the main storm and will strike without warning on a sunny day. They are signs of an approaching storm and are known colloquially as "bolts from the blue". Another special type of cloud-to-ground lightning is bead lightning. This is a regular cloud-to-ground stroke that contains a higher intensity of luminosity. When the discharge fades it leaves behind a string of beads effect for a brief moment in the leader channel. A third special type of cloud-to-ground lightning is ribbon lightning. These occur in thunderstorms where there are high cross winds and multiple return strokes. The winds will blow each successive return stroke slightly to one side of the previous return stoke, causing a ribbon effect. The last special type of cloud-to-ground lightning is staccato lightning, which is nothing more than a leader stroke with only one return stroke. Cloud-to-cloud or intercloud lightning is a somewhat rare type of discharge lightning between two or more completely separate cumulonimbus clouds. Ground-to-cloud lightning is a lightning discharge between the ground and a cumulonimbus cloud from an upward-moving leader stroke. 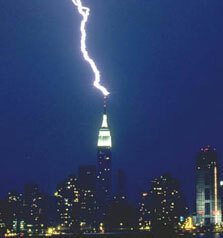 Most ground-to-cloud lightning occurs from tall buildings, mountains and towers. Heat lightning (or, in the UK, "summer lightning") is nothing more than the faint flashes of lightning on the horizon from distant thunderstorms. Heat lightning was named because it often occurs on hot summer nights. Heat lightning can be an early warning sign that thunderstorms are approaching. In Florida, heat lightning is often seen out over the water at night, the remnants of storms that formed during the day along a sea breeze front coming in from the opposite coast. Some cases of "heat lightning" can be explained by the refraction of sound by bodies of air with different densities. An observer may see nearby lightning, but the sound from the discharge is refracted over his head by a change in the temperature, and therefore the density, of the air around him. As a result, the lightning discharge appears to be silent. Ball lightning is described as a floating, illuminated ball that occurs during thunderstorms. They can be fast moving, slow moving or nearly stationary. Some make hissing or crackling noises or no noise at all. Some have been known to pass through windows and even dissipate with a bang. Ball lightning has been described by eyewitnesses but rarely, if ever, recorded by meteorologists. The engineer Nikola Tesla wrote, "I have succeeded in determining the mode of their formation and producing them artificially" (Electrical World and Engineer, 5 March 1904). There is some speculation that electrical breakdown and arcing of cotton and gutta-percha wire insulation used by Tesla may have been a contributing factor, since some theories of ball lightning require the involvement of carbonaceous materials. Some later experimenters have been able to briefly produce small luminous balls by igniting carbon-containing materials atop sparking Tesla Coils. Ball lightning field properties are more extensive than realized by many scientists not working in this field. The typical fireball diameter is usually standardized as 20–30 cm, but ball lightning several meters in diameter has been reported (Singer). A recent photograph by a Queensland ranger, Brett Porter, showed a fireball that was estimated to be 100 meters in diameter. The photograph has appeared in the scientific journal Transactions of the Royal Society. The object was a glowing globular zone (the breakdown zone?) with a long, twisting, rope-like projection (the funnel?). Fireballs have been seen in tornadoes, and they have also split apart into two or more separate balls and recombined. Fireballs have carved trenches in the peat swamps in Ireland. Vertically linked fireballs have been reported. One theory that may account for this wider spectrum of observational evidence is the idea of combustion inside the low-velocity region of axisymmetric (spherical) vortex breakdown of a natural vortex (e.g., the 'Hill's spherical vortex'). The scientist Coleman was the first to propose this theory in 1993 in Weather, a publication of the Royal Meteorological Society. Ball lightning is hardly ever seen. In fact, there are only a few pictures of it. 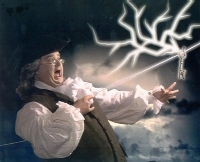 St Elmo's fire was correctly identified by Franklin as electrical in nature. It is not the same as ball lightning. Reports by scientists of strange lightning phenomena above storms date back to at least 1886. However, it is only in recent years that fuller investigations have been made. This has sometimes been called mega lightning. Sprites are now well-documented electrical discharges that occur high above the cumulonimbus cloud of an active thunderstorm. They appear as luminous reddish-orange, neon-like flashes, last longer than normal lower stratospheric discharges (typically around 17 milliseconds), and are usually spawned by discharges of positive lightning between the cloud and the ground. Sprites can occur up to 50 km from the location of the lightning strike, and with a time delay of up to 100 milliseconds. Sprites usually occur in clusters of two or more simultaneous vertical discharges, typically extending from 65 to 75 km (40 to 47 miles) above the earth, with or without less intense filaments reaching above and below. Sprites are preceded by a sprite halo that forms because of heating and ionization less than 1 millisecond before the sprite. Sprites were first photographed on July 6, 1989, by scientists from the University of Minnesota and named after the mischievous sprites in the plays of Shakespeare. Blue jets differ from sprites in that they project from the top of the cumulonimbus above a thunderstorm, typically in a narrow cone, to the lowest levels of the ionosphere 40 to 50 km (25 to 30 miles) above the earth. They are also brighter than sprites and, as implied by their name, are blue in color. They were first recorded on October 21, 1989, on a video taken from the space shuttle as it passed over Australia. Elves often appear as a dim, flattened, expanding glow around 400 km (250 miles) in diameter that lasts for, typically, just one millisecond. They occur in the ionosphere 100 km (60 miles) above the ground over thunderstorms. Their color was a puzzle for some time, but is now believed to be a red hue. Elves were first recorded on another shuttle mission, this time recorded off French Guiana on October 7, 1990. Elves is a frivolous acronym for Emissions of Light and Very Low Frequency Perturbations From Electromagnetic Pulse Sources. This refers to the process by which the light is generated; the excitation of nitrogen molecules due to electron collisions (the electrons having been energized by the electromagnetic pulse caused by a positive lightning bolt). On September 14, 2001, scientists at the Arecibo Observatory photographed a huge jet double the height of those previously observed, reaching around 80 km (50 miles) into the atmosphere. The jet was located above a thunderstorm over the ocean, and lasted under a second. Lightning was initially observed traveling up at around 50,000 m/s in a similar way to a typical blue jet, but then divided in two and sped at 250,000 m/s to the ionosphere, where they spread out in a bright burst of light. On July 22, 2002, five gigantic jets between 60 and 70 km (35 to 45 miles) in length were observed over the South China Sea from Taiwan, reported in Nature. The jets lasted under a second, with shapes likened by the researchers to giant trees and carrots. Lightning has been triggered directly by human activity in several instances. Lightning struck the Apollo 12 soon after takeoff, and has struck soon after thermonuclear explosions. It has also been triggered by launching rockets carrying spools of wire into thunderstorms. The wire unwinds as the rocket climbs, making a convenient path for the lightning to use. These bolts are typically very straight. Lightning requires the electrical breakdown of gas, so lightning cannot exist in the vacuum of space. However, lightning has been observed within the atmospheres of other planets, such as Venus and Jupiter. Lightning on Jupiter is estimated to be 100 times as powerful, but fifteen times less frequent, than that which occurs on Earth. Lightning on Venus is still a controversial subject after decades of study. During the Soviet Venera and U.S. Pioneer missions of the '70s and '80s, signals suggesting lightning may be present in the upper atmosphere were detected. However, recently the Cassini-Huygens mission fly-by of Venus detected no signs of lightning at all. Thunderstorms are the primary source of lightning. Because people have been struck many kilometers away from a storm, seeking immediate and effective shelter when thunderstorms approach is an important part of lightning safety. Contrary to popular notion, there is no 'safe' location outdoors. People have been struck in sheds, makeshift shelters, etc. A better location would be inside a vehicle (a crude type of Faraday cage). It is advisable to keep appendages away from any attached metallic components once inside (keys in ignition, etc.). Several different types of devices, including lightning rods, lightning arresters, and electrical charge dissipaters, are used to prevent lightning damage and safely redirect lightning strikes. 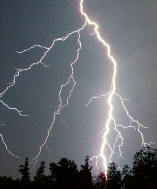 Nearly 2000 persons per year in the world are injured by lightning strikes, and between 25 to 33 % of those struck die. Lightning injuries result from three factors: electrical damage, intense heat, and the mechanical energy which these generate. While sudden death is common because of the huge voltage of a lightning strike, survivors often fare better than victims of other electrical injuries caused by a more prolonged application of lesser voltage. In a direct hit the electrical charge strikes the victim first. Counter intuitively, if the victim's skin resistance is high enough, much of the current will flash around the skin or clothing to the ground, resulting in a surprisingly benign outcome. Splash hits occur when lightning effectively bounces off a nearby object and strikes the victim en route to ground. Ground strikes, in which the bolt lands near the victim and is conducted through the victim via his or her connection to the ground (such as through the feet), can cause great damage. The most critical injuries are to the circulatory system, the lungs, and the central nervous system. Many victims suffer immediate cardiac arrest and will not survive without prompt emergency care, which is safe to administer because the victim will not retain any electrical charge after the lightning has struck (of course, the helper could be struck by a separate bolt of lightning in the vicinity). Others incur myocardial infarction and various cardiac arrhythmias, either of which can be rapidly fatal as well. The intense heat generated by a lightning strike can cause lung damage, and the chest can be damaged by the mechanical force of rapidly expanding heated air. Either the electrical or the mechanical force can result in loss of consciousness, which is very common immediately after a strike. Amnesia and confusion of varying duration often result as well. A complete physical examination by paramedics or physicians may reveal ruptured eardrums, and ocular cataracts may develop, sometimes more than a year after an otherwise uneventful recovery. The lightning often leaves skin burns in characteristic Lichtenberg figures, sometimes called lightning flowers; they may persist for hours or days, and are a useful indicator for medical examiners when trying to determine the cause of death. They are thought to be caused by the rupture of small capillaries under the skin, either from the current or from the shock wave. It is also speculated that the EMP (electro-magnetic pulse) created by a nearby lightning strike can cause cardiac arrest. There is sometimes spectacular and unconventional lightning damage. Hot lightning which lasts for more than a second can deposit immense energy, melting or carbonizing large objects. One such example is the destruction of the basement insulator of the 250-metre-high central mast of the long wave transmitter at Orlunda, Sweeden, which led to its collapse. A bolt of lightning can reach temperatures approaching 28,000 kelvins (50,000 degrees Fahrenheit) in a split second. This is about five times hotter than the surface of the sun. The heat of lightning which strikes loose soil or sandy regions of the ground may fuse the soil or sand into glass channels called fulgurites. These are sometimes found under the sandy surfaces of beaches and golf courses, or in desert regions. Fulgurites are evidence that lightning spreads out into branching channels when it strikes the ground. Trees are frequent conductors of lightning to the ground. Since sap is a poor conductor, its electrical resistance causes it to be heated explosively into steam, which blows off the bark outside the lightning's path. In following seasons trees overgrow the damaged area and may cover it completely, leaving only a vertical scar. If the damage is severe, the tree may not be able to recover, and decay sets in, eventually killing the tree. Occasionally, a tree may explode completely. It is commonly thought that a tree standing alone is more frequently struck, though in some forested areas, lightning scars can be seen on almost every tree. Of all common trees the most frequently struck is the oak. It has a deep central root that goes beneath the tree, as well as hollow water-filled cells that run up and down the wood of the oak's trunk. These two qualities make oak trees better grounded and more conductive than trees with shallow roots and closed cells. The odds of an average person living in the USA being struck by lightning once in his lifetime has been estimated to be 1:3000. The city of Teresina in northern Brazil has the third-highest rate of occurrences of lightning strikes in the world. The surrounding region is referred to as the Chapada do Corisco ("Flash Lightning Flatlands"). The United States is home to "Lightning Alley", a group of states in the American Southeast that collectively see more lightning strikes per year than any other place in the US. The most notable state in Lightning Alley is Florida. The saying "lightning never strikes twice in the same place" is false. The Empire State Building is struck by lightning on average 100 times each year, and was once struck 15 times in 15 minutes. Some repeat lightning strike victims claim that lightning can choose its target, although this theory is entirely disregarded by the scientific community. Jim Caviezel, the actor who played Jesus in the film The Passion of the Christ, is reported to have been struck by lightning during shooting. The assistant director Jan Michelini was struck twice. Golfers Retief Goosen and Lee Trevino have both been struck by lightning while playing. Although commonly associated with thunderstorms, lightning strikes can occur on any day, even in the absence of clouds. Lightning interferes with AM (amplitude modulation) radio signals much more than FM (frequency modulation) signals, providing an easy way to gauge local lightning strike intensity. In movies and comics of the contemporary U.S. and many other countries, lightning is often employed as an ominous, dramatic sign. It may herald a waking of a great evil or emergence of a crisis. This has often also been spoofed, with the uttering of certain words or phrases causing flashes of lightning to appear outside of windows (and often scaring or disturbing some characters). While this is usually typical of cartoons, it has also been employed by regular TV shows and movies. Various novels and role playing games with fantasy tint involves wizardry of lightning bolt, weapon embodying the power of lightning, etc. The comic book character Billy Batson changed into the superhero Captain Marvel by saying the word "Shazam! ", which called down a bolt of magic lightning to make the change. Flash II (Barry Allen) and III (Wally West) were both granted their super speed in accidents involving lightning. The bolt of lightning in heraldry is distinguished from the lightning bolt and is shown as a zigzag with non-pointed ends. It is also distinguished from the "fork of lightning". The lightning bolt shape was a symbol of male humans among the Native Americans such as the Apache (a rhombus shape being a symbol for females) in the American Old West. The name of New Zealand / Australia's most celebrated thoroughbred horse, Phar Lap, derives from the shared Zhuang and Thai word for lightning. Images used are either in the public domain, licensed under the GFDL, or permitted for use by their originator.